Health officials are warning that an explosion of ticks will be here this summer–which could cause a greater surge in Lyme disease cases. I brought this to a graduation party this weekend. The party went into the evening and it was on a farm, by a river, so you can imagine the bugs! I sprayed myself and a few other guests who loved the smell (one person nailed it when they said it reminded them of lemon Pledge :)). Everyone was protected and didn't get eaten alive. 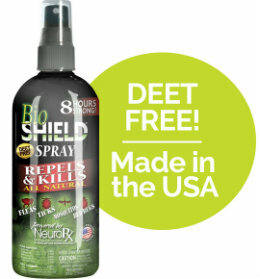 Works great and I don't have to worry about Deet and other horrible pesticides on my skin and clothes. 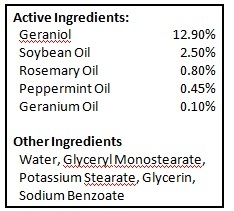 BioShield™ contains a blend of plant oils including geraniol, soybean, rosemary, peppermint and geranium. 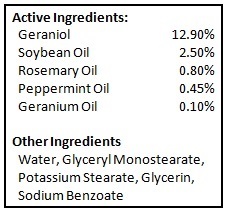 This specific blend of oils, called NeuroRX™, was developed by pharmacists for prescription strength results. NeuroRX™ works by attacking a neurotransmitter, octopamine, found only in insects. NeuroRX™ blocks the octopamine, causing a complete shutdown of the central nervous system, killing insects nearly instantaneously. We humans, along with other mammals, birds and fish can not be harmed by this octopamine blocking property, as we neither produce nor use octopamine in our bodies. NeuroRX™ is safe to use around children and pets but is deadly to insects when used as directed. BioShield has a crisp, herbal scent and lasts up to 8 hours. 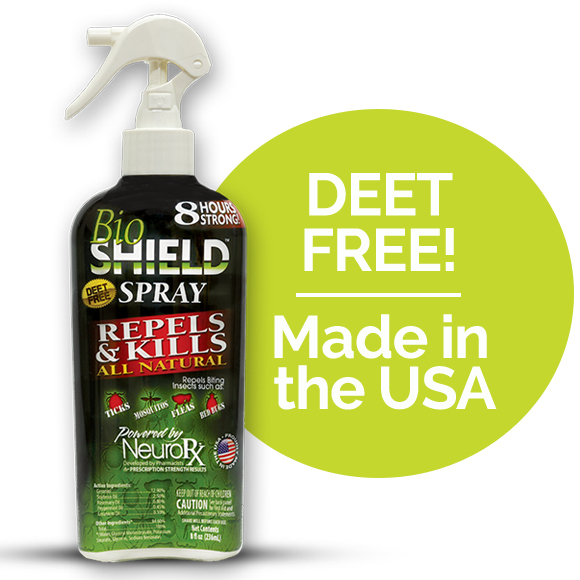 The convenient spray bottle makes BioShield easy to apply so you can start repelling fleas, ticks, mosquitoes, chiggers, black flies and bed bugs quickly. Go enjoy the outdoors again. For external use only. Shake well before using. Hold bottle 6 to 8 inches from skin and spray in a sweeping motion and rub skin evenly covering exposed skin. Do not spray near eyes or mouth. To apply to face or on children, spray into your hand and rub on. Apply as needed as effectivenss varies with perspiration.